If this saying is true, then the American Rose Society (ARS) has been fortunate to have had its fair share of Champions! 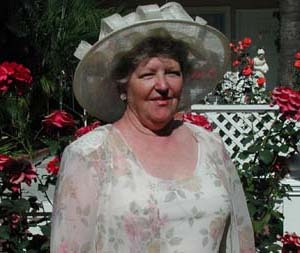 Now the latest person to assume the difficult and demanding role of Chief Executive Officer and President is Jolene Adams of Hayward, California. 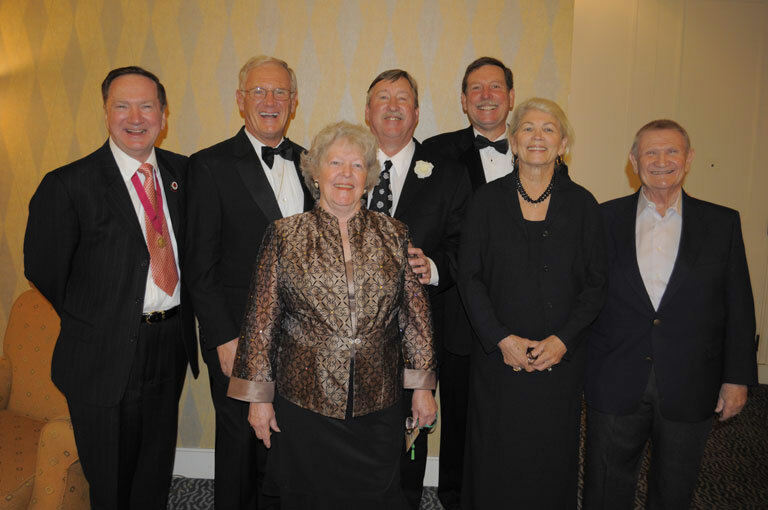 Here she is shown from left to right with American Rose Society Past Presidents Dr. Tommy Cairns, Jim Hering, Jeff Wyckoff, Steve Jones, Marilyn Welan (only the 2nd woman ever to be elected an ARS president, Jolene is the 3rd) and Vincent Gioia. Saturday, June 29th, I had the pleasure of meeting Jolene Adams for the very first time in person. 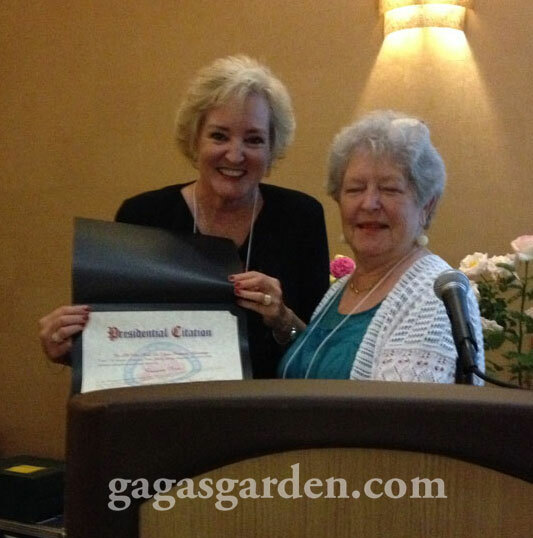 She kindly invited me to the “Roses By The Bay” ARS North Central District Convention & Rose Show in Green Bay, Wisconsin, where little did I know I was to receive an “ARS Presidential Citation” for my work in promoting roses and encouraging membership through use of various social media. Upon meeting Jolene for the very first time one’s impressions are of her laser-like piercing blue eyes and the charismatic power of her spirit. Jolene Adams is undoubtedly a force for good! 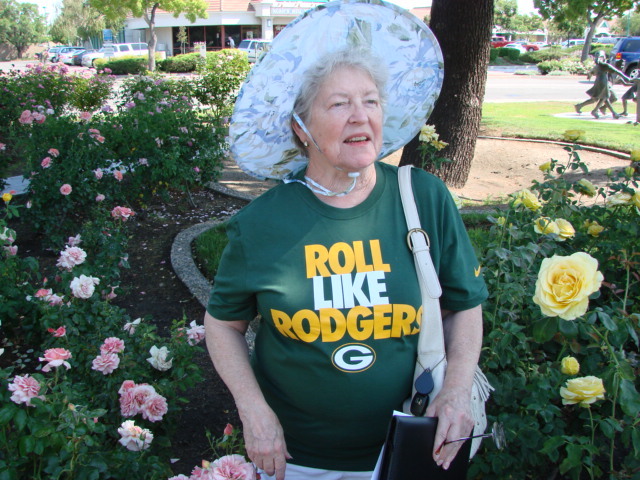 She is the perfect role model for the world of roses! She possesses a passion for roses in her heart, style in conversation, the compelling force of true conviction and a comfortable manner of delivery that people are naturally drawn to. Believing that education is the road to growing good roses, she is an indefatigable force in lecturing and writing about roses! Inviting her audience to kneel down and get their fingers in the dirt are very successful techniques to motivate new growers. 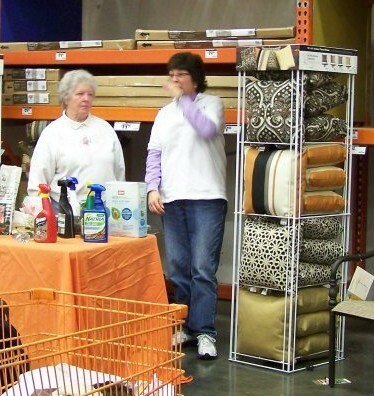 After all – people come to her lectures to learn and become part of the total gardening experience. They love it and they adore Jolene Adams. She also believes that the award winning bimonthly American Rose magazine that reaches more than 8000 members is the most powerful forum to continue to educate and win hearts and minds to the enjoyment of growing roses. Early in her term of office, Jolene appointed chairs for several ARS committees to help her in creating a themed editorial calendar that is cohesive with real content. She has added columnists and writers who share their passion and rose knowledge, and Clippings, which is the best of the best from local society newsletters. One of the most exciting features in American Rose is the author from all over the world who contribute articles exclusively dedicated to roses. This past issue guest author Prof. Akira Ogawa of the Japan Rose Society crafted a beautiful article on the devastating Tsunami and the loss of the Futaba Rose Gardens. The ARS & You is perhaps one of her finest achievements. Jolene appointed an editor & chair, Mary Hext and Sue Tiffany, to produce a topical 12-page electronic newsletter aimed at our local society members and consisting of coming attractions, news from ARS, reminders about ARS contests like the children’s essays and poetry, newsletter and bulletin competitions, photography competition and horticulture events to be held at the Shreveport headquarters of ARS. This outstanding publication is available to members and non-members alike and is a treasure trove of information. What the rose world needs are many more champions like Jolene Adams. You can sense her empathy right away. With Jolene it’s not so much about her, its all about roses and helping people to do what they love better through education. A riveting speaker, Jolene gave a wonderful presentation on her recent trip to South Africa for the Triennial World Rose Convention. The audience was enthralled. I want to be more like Jolene Adams and wish there were more people doing what she does; teaching people how easy it is to grow beautiful roses. I believe most everyone wants a rose garden and Jolene teaches as many people as possible that they can have one. That’s why she’s a perfect role model and Champion of the Rose. Jolene, you truly are a champion. Thanks for all you do for the American Rose Society. Jolene is a Rose Champion and she champions them in all that she does. 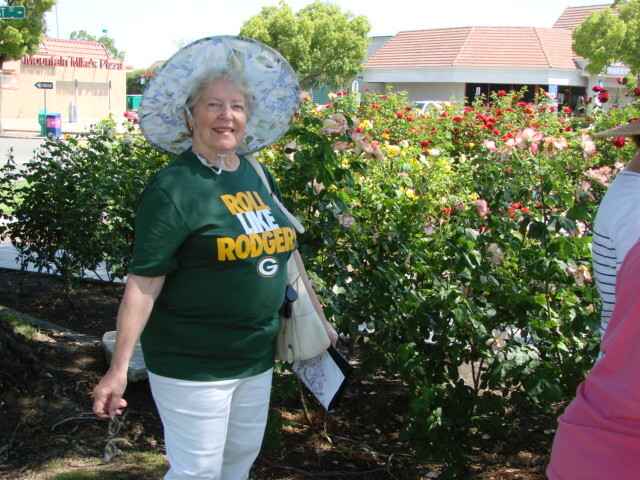 She is indefatigable in reaching out to all 18 districts in the American Rose Society (ARS). I admire her greatly for her vision and goals for the future of ARS. It is a privilege to be the Chair of the Local Society Relations Committee and the publisher of ARS & You. Thank you, dear Cousin, for writing this great article about Jolene. Congratulations on your well-deserved Presidential Citation. Thank-you so much for all of your support. I agree with you completely. 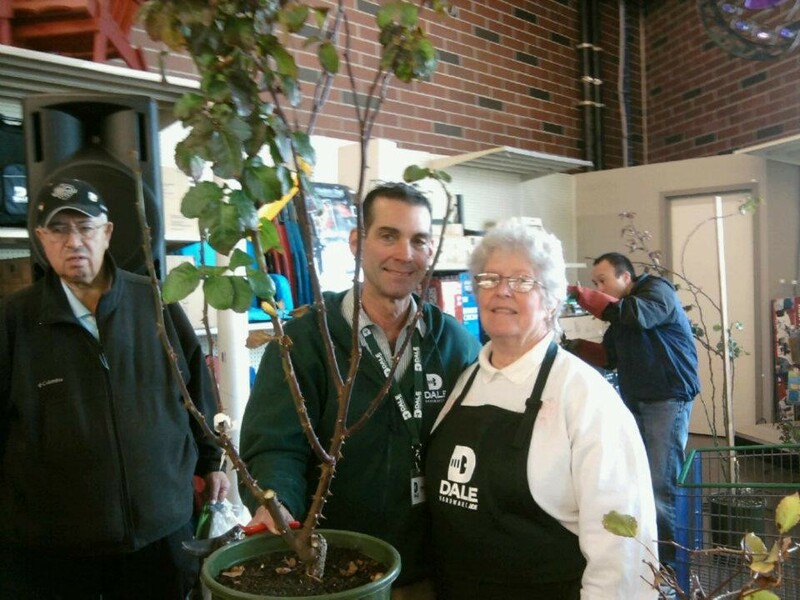 Jolene is truly a Champion of The Roses and supports rose growers every way she can. She and people like her are the future of getting more people especially children out into the garden to enjoy growing beautiful roses and I know you are also working so hard through the wonderful publication ARS & You. Thank-you. I have met Jolene twice and we became instant friends. It helps to have friends in high places!